Selection Sunday is just 2 days away! Do I take the 5 or the 12 here? Will all the #1 seeds make it through? Is this the year a 1 goes down to a 16? But wait, there’s more … prizes, sort of. Runner-up of the G7D challenge will receive a copy of Carey Casey’s Championship Fathering, and a $25 donation made in their honor to the National Center for Fathering. The winner will receive a copy of the book and a $75 donation. So please sign up and help us benefit the NCF. The only rule is: dads, involve your kids. This shouldn’t be difficult if they are basketball fans, but even if they aren’t, get their input, and watch the games together to see how your picks unfold. The whole idea here is to enjoy the games together. 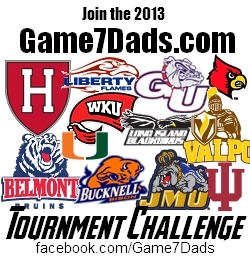 You may have to endure your child picking a 16-seed over a #1 because they like the mascot, but that’s how it goes! Subscribe to the blog here and join us on Facebook for updates and insights as the tournament unfolds. Have fun and enjoy the madness!